Brian Hall, the general manager of the Surface brand at Microsoft, have a few choice words for Apple’s penchant for selling old tech. 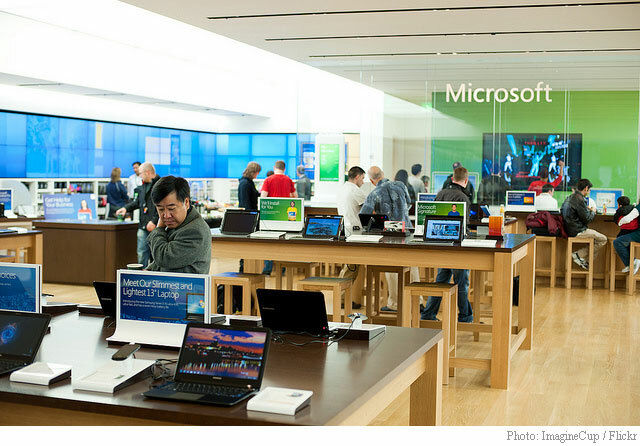 Old nemesis Apple Inc. (NASDAQ:AAPL) and Microsoft Corporation (NASDAQ:MSFT) are at it again. This time, Brian Hall, general manager of the Surface brand at Microsoft, said the Cupertino-based tech company is doing its customers a great disservice by offering old technology instead of innovative devices. In a tweet, Hall hinted that Apple is no longer investing more into product research and groundbreaking technology. For decades, Microsoft and Apple have competed in various businesses including software, hardware, and other services. The competition often led to word wars between executives and fans. Indeed, the MacBook Air’s current design is 6 years old while the MacBook Pro remained unchanged since 2012. Apple’s Macs haven’t been updated with the latest processors. Despite being the most coveted smartphone in the world, the iPhone has been slammed by critics for its lack of innovative features. Since the rollout of the iPhone 6S, iPhone’s design remained the same although newer models came with an improved software. Unfortunately, the iPhone 7 is rumored to sport the same old design. Although the new iPhone may feature tweaked software and hardware, they are nothing that the market has not seen before. Meanwhile, Samsung’s Galaxy S7 features a revamped hardware, water resistant design, and support for wireless charging and 4K recording along with a host of new software features. In addition, Apple’s iPhone SE, which was released with much fanfare, failed to impress consumers simply because of the dated hardware. The SE, which was launched last March 2016, sports the iPhone 5’s design, a move to please users who prefer a smaller iPhone. Apple has been criticized for launching a design that’s been around since 2012, highlighting the company’s diminishing innovation level since Tim Cook took the helm. More and more consumers are noticing that Apple’s latest devices do not offer the newest processors and it is taking a toll on sales. Apple’s failure to deliver innovative products caused its computer shipment to shrink by 11.5% annually last quarter. Although Apple did not comment on Hall’s tweet, the iPhone maker did release a new iPad Pro commercial, wherein the company tries to convince viewers that its newest slate is just as capable as your average computer. However, critics noted that to be able to use the iPad Pro as a laptop, users have to purchase the slate’s two other accessories, a stylus, and a keyboard, both of which cost a pretty penny. The Cupertino tech giant is expected to release a new Mac computer this fall just before the holiday season. Rumor has it that a new MacBook Pro is also in the works and it might feature a new touchscreen keyboard and the latest Intel chips. Despite mounting accusations, Apple remained tight-lipped on the issue but CEO Tim Cook is bound to clear the air once he takes the stage to present the new iPhone sometime in September. In related Microsoft news, shares in the $451 billion market cap software giant are up 0.24 percent on Monday at $58.10. They’re now up 24% on a year-over-year basis and off about 1.30% from their $58.71 all-time high. The T-12 revenue at MSFT is $85.32 billion. Msoft’s price-to-earnings growth ratio is 2.35. As for passive income investors, the Redmond Washington-based company pays shareholders $2.48 per share annually in dividends, yielding 1.44. Don’t think Tim cook will be taking any stages or presenting iPhone 7 anytime soon. RIP..
With such mistake, probably the rest of this article is just as accurate….